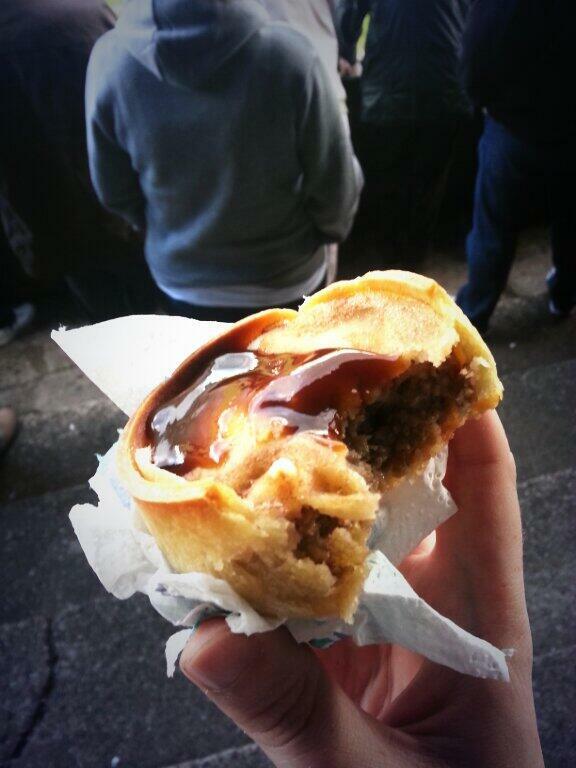 Pie 12: The Wembley Pie? We’re The Famous Tartan Army and we came to Wembley! This is a Bonus Pie! 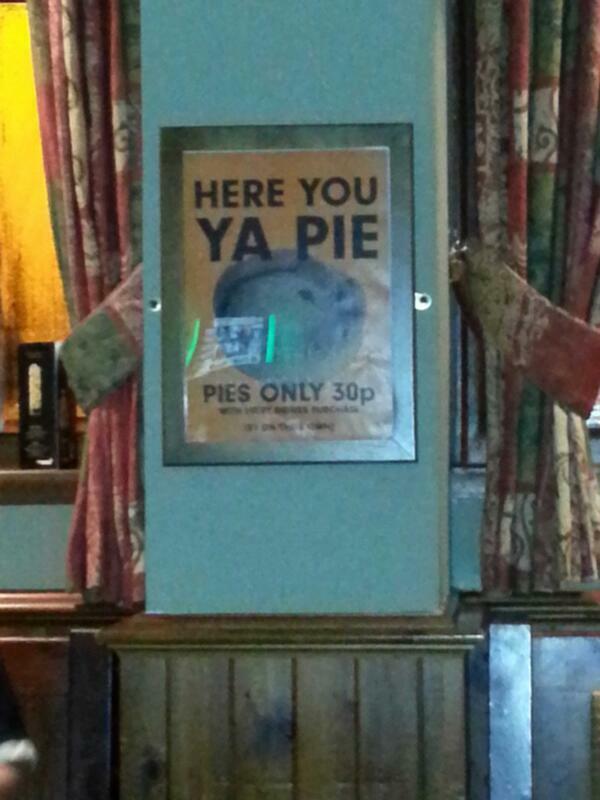 Why a bonus pie I here you ask? Because this was a picture taken before the invention of ‘Meat Filled Pastries: A Tour of Pies’ and so therefore misses some of the key elements for a true ‘Gravy Factor’. However with that being said, lets rate this pie! Price: Unknown, by this point both myself and my fellow TA soldier were heavily inebriated and I was not the purchaser of this particular pastry delicacy. The only comparison I have is that whilst Scotty was getting the pie’s in, I got the programmes, they were £6 a pop, more like a glossy magazine. 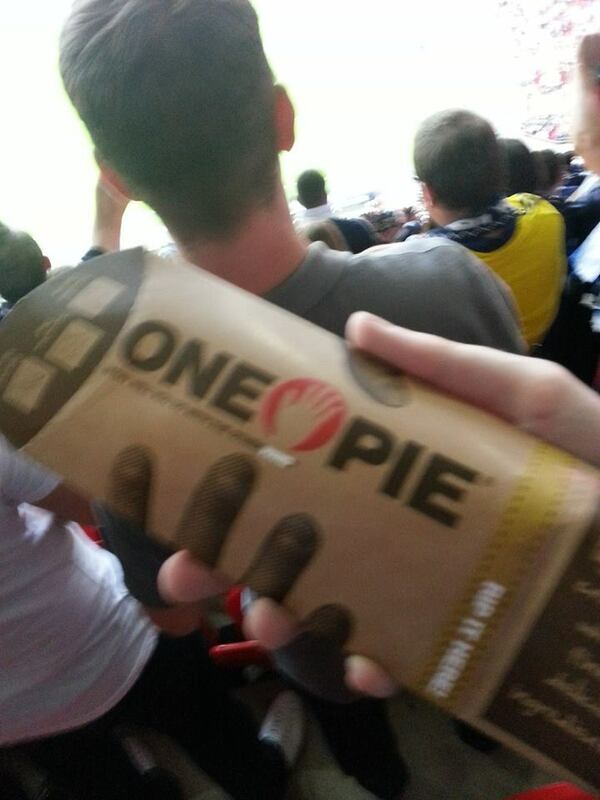 Therefore this pie cost £6 actually it cost £12 as we had to share one because they had ran out, a cardinal sin at any football ground. Presentation: As can be seen above I wasn’t able to get the ‘one bite expose’, however what can be seen already that this came in a long rectangular box that said ‘One Pie’ on it with handy finger guides in case you forget how to hold things I presume. Although it did keep it piping hot the creative genius who created said packaging forgot one vital, vital piece of information, ‘THAT’S NO’ A PIE’. Meatiness: The best way to describe this is a Chicken Fajita Sausage Roll, with as much peppers and onions as there was chicken resulting in a meat content of about 50%. Pastry: The Pastry was flaky, it was a good job the Marketing Graduate who designed the box did otherwise I feel the filling may have ended on the floor such was the floppy nature of the ‘pie’ (it’s still not a pie). Overall: A spicy, tasty treat but NOT a Pie! 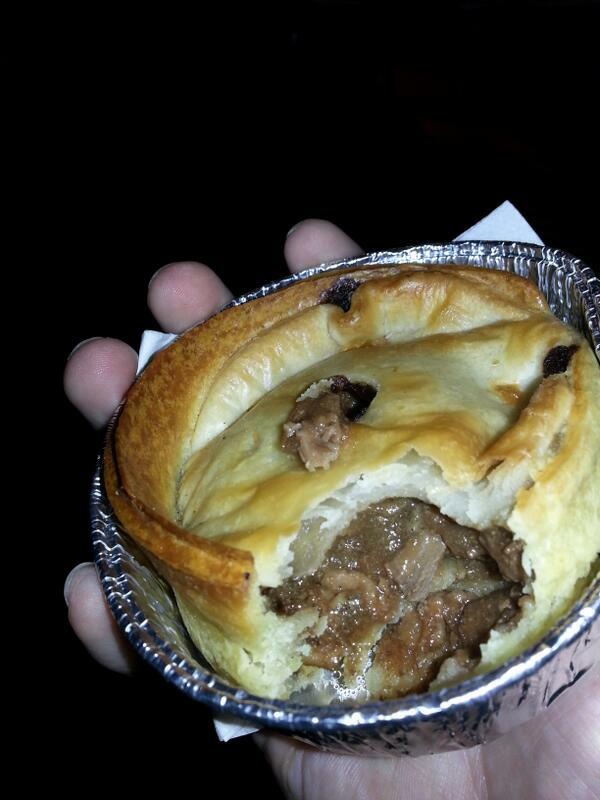 Gravy Factor: I am so confused that this was called a pie: As much gravy as a Sherry Trifle! 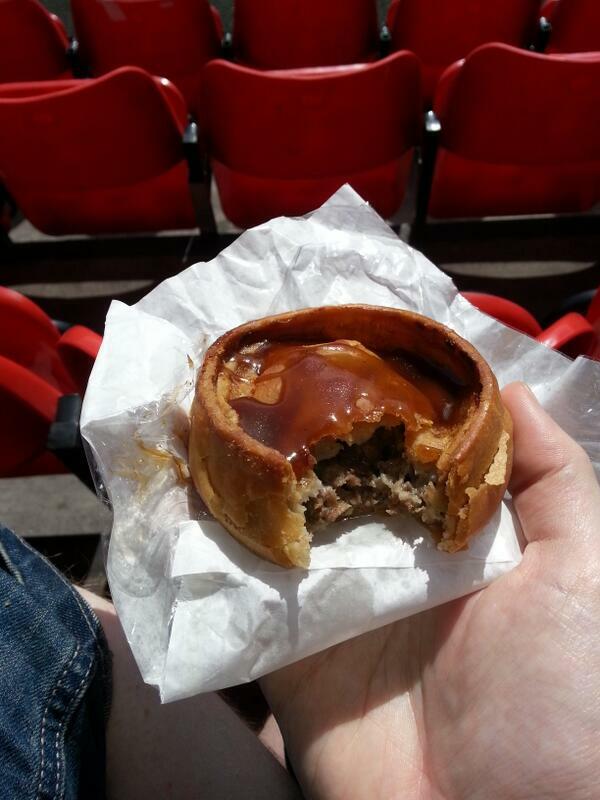 Bonus Note: Leading The Line: Scottish Football and the Rest of the Sporting World a blog not based solely on pies, I know a ridiculous idea, will be back to its regular best in the not to distant future. But until next time, MON THE PIES! 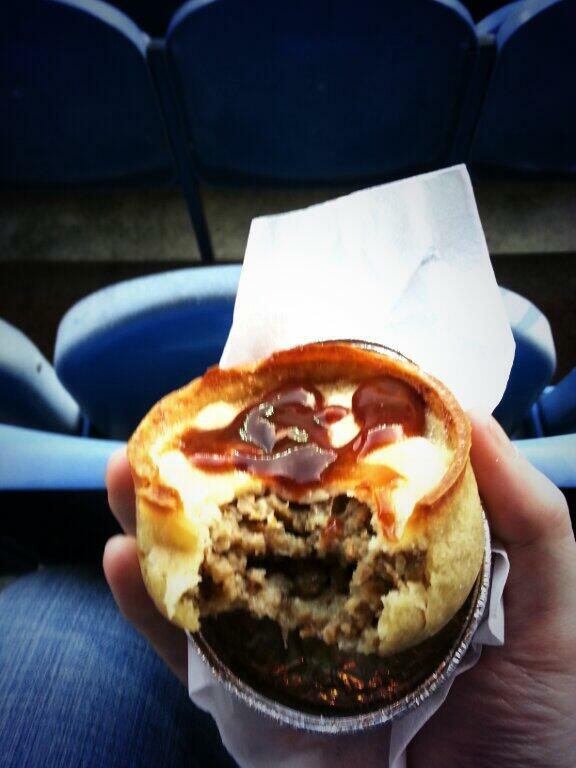 This entry was posted in But That's Not a Pie!, Football Pies, Passport Pies, Sporting Pies, The Life of Pie and tagged auld enemy, england, Gravy, Meat, pastry, Pie, scotland, tartan army, wembley. I should stress as we start on this Journey of Pie, I am not going to give you lots of instagrammed images of pies, pastry touched up with yellow food colouring or the cheery face of the person who has presented it to me. No, instead it will be a one bite expose of the pie in all its meaty glory. 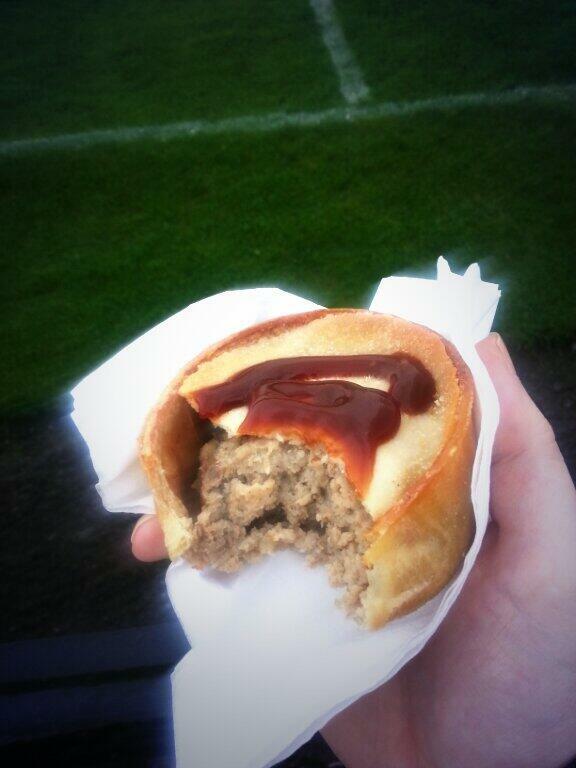 In most cases the pie will have ‘broon’ sauce on it, as far as I am concerned this is how a pie should be. With that out the way lets rate some pie! Where: Adamslie Park, Home of Kirkintilloch Rob Roy JFC. Price: £1. Bargain for a pie in today’s climate, especially considering the sprint from work to the game involved missing my dinner. Sad Times. Presentation: Presented in a piece of kitchen paper your Granny would be proud of, no frills but plenty of flowery designs. Pastry: The top edges were crispy without being teeth breaking, although the bake on the bottom was a little firm resulting in some minor spillage when biting all the way through. Overall: A solid effort from The Rabs, nothing spectacular, but tasty enough. 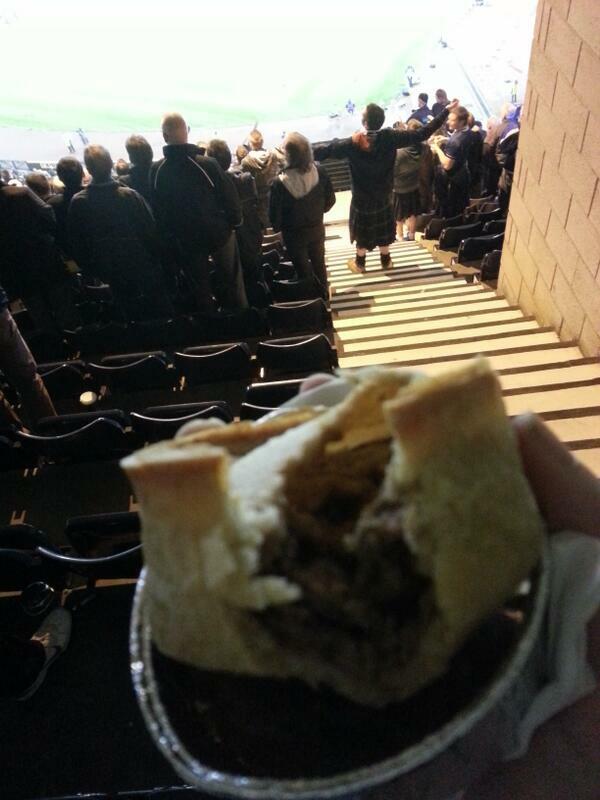 This entry was posted in Football Pies, Junior Pies, Sporting Pies, The Life of Pie and tagged brown sauce, Football, Gravy, Meat, pastry, Pie, pollok, rob roy.